The Weed-Ripper is a unique tool is designed to pull aquatic weeds by the roots so they cannot grow back as quickly. Works best for underwater weeds including lily pads (water lilies) pencil reeds and most other lake & pond vegetation with stems under 1 inch in diameter. If they are too deeply rooted it will still remove them by cutting / ripping there stems below the water surface. We do not recommend using the WeedRipper to cut Cattails. If you are looking for tools for cutting cattails visit our cattail cutter category. It works best on weeds that have stems 1" wide or less including Lily Pads, Pencil, Bull rushes, Elodea, Water celery, Vallisneria, Eel grass and similar kinds of submersed and emersed aquatic vegetation. Throw it out from a dock or shoreline and retrieved using the 25' rope and a shorter handle. Or you can connect all of the handles to pull seaweed around your dock or shoreline. The unique tapered design of the pulling teeth make it easy to remove pulled weeds from the WeedRipper head. 4ft (stub handle) Works best for primarily throwing and retrieving. The Weed Ripper features a 3 foot white heavy duty aluminum head. The unique curved handle grip makes it easier to pull dense loads with less effort. 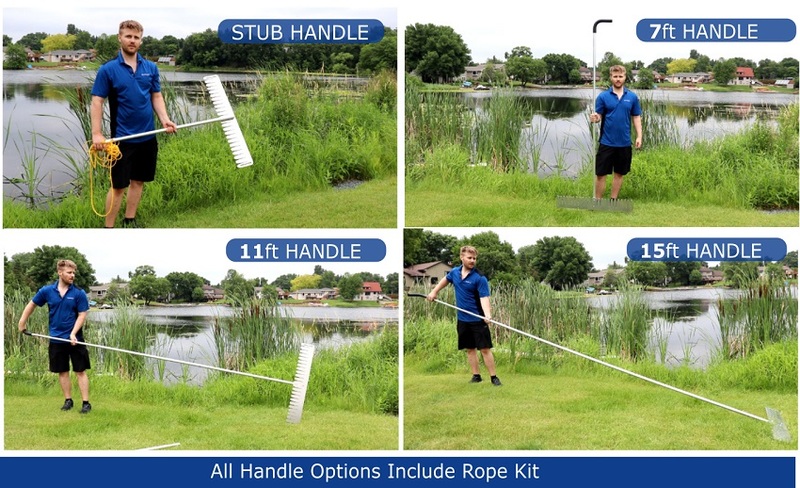 Comes with a 25' rope allowing you to cut and pull weeds by tossing out and retrieving. The Weed Ripper does a great job of clearing weeds from our Florida lake, it gets them out by the roots.